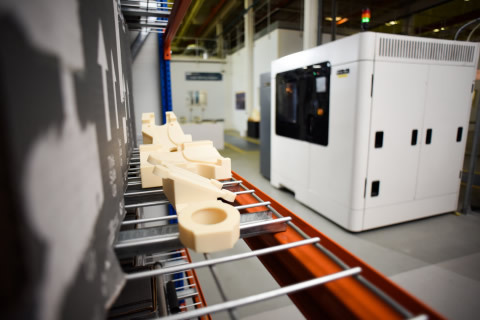 Stratasys today announced that GKN Aerospace is improving production times and removing design constraints for multiple tooling applications since integrating additive manufacturing at its Filton manufacturing site in the UK. GKN serves over 90 percent of the world’s aircraft and engine manufacturers with aerostructures, engine systems and technologies. According to Tim Hope, Additive Manufacturing Center Manager, at GKN Aerospace, the company decided to invest in the Stratasys F900 Production 3D Printer in a bid to cut lead times for production-line tools, and to create complex parts, impossible to make with traditional manufacturing methods. “Since integrating the F900, we have dramatically reduced production-line downtime for certain teams and are enjoying a new found freedom to design complex tools,” he says. Traditionally, the lead-time required to produce a metal or plastic replacement tool is several weeks. Now, with the ability to use an in-house production 3D printer to do the same job, the replacement burden has been removed and the responsiveness to manufacturing requirements improved. While GKN Aerospace is using a standard thermoplastic today, it is experimenting with Stratasys’ high-strength, heat-resistant ULTEM™ 1010 Resin material for these applications. In addition, GKN Aerospace is reporting unprecedented levels of design freedom since investing in the Stratasys F900 into its operations. In addition to design freedom benefits, GKN Aerospace has also seen a 40 percent decrease in material waste. Hope anticipates a greater move towards the use of FDM additive manufacturing to produce high-value, flight-critical, end-use composite parts. Stratasys, FDM, and Fortus are registered trademarks, and the Stratasys signet is a trademark of Stratasys Ltd. and/or its subsidiaries or affiliates. ULTEM 1010 Resin is a registered trademark of SABIC or its affiliates or subsidiaries. All other trademarks are the property of their respective owners.